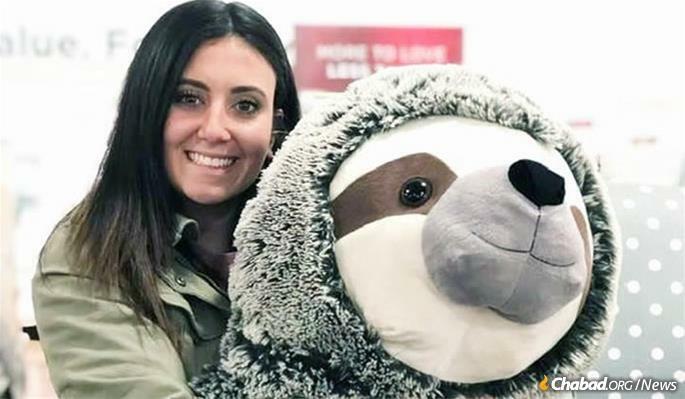 Samantha Josephson, a 21-year-old University of South Carolina student who was murdered on March 29 after getting into a car she thought was her Uber ride home. As the daylight faded on Sunday night in Columbia, S.C., hundreds of candles illuminated the darkness, and the words of Tehillim (Psalms), were read aloud as students, community members, friends and family gathered to remember Samantha Josephson, a 21-year-old University of South Carolina student who was murdered on March 29. “Many of you are getting ready for a joyous occasion—your graduation—and then this evil, evil tragedy occurs, and Samantha is no longer with us. In what universe does it make sense that we are standing here at this young woman’s vigil?” asked Chabad-Lubavitch Rabbi Meir Muller, professor of early-childhood education at the university and principal of the Cutler Jewish Day School in Columbia. A senior at the University of South Carolina, Josephson was a native of New Jersey. She was set to graduate in just a few weeks and was looking forward to starting at Drexel University Law School in Philadelphia in the fall. She had been out with friends in the very early hours of Friday when she got separated from them, called for an Uber to take her home and then got into a car she thought was her ride. Her body was found later that day some 90 miles away. The man accused of abducting and killing her was arrested on Saturday. Word of Josephson’s passing hit home at Chabad at the University of South Carolina—run by Rabbi Sruly Epstein and his wife, Shlomit—as the emissaries know quite a number of Josephson’s friends and Jewish sorority sisters. Though they said they didn’t know Josephson personally, they do recall her attending a holiday program. Chabad at the University of South Carolina will hold a special Shabbat program in memory of the victim, and once again, candlelight will shine in memory of a young woman whose presence, her friends say, would light up the room. Josephson’s passing was particularly hard for the school community because she was doing something many people do on a regular basis—making use of a ride-share service. “There’s a sense that the school will unite in this effort to advance the safety of students getting into ride shares,” said Epstein, who recited chapters of Psalms during Sunday’s vigil. Ride-share safety is also the mission that Josephson’s father, Seymour Josephson, is taking upon himself. As he told the students at the vigil, which both he and his wife, Marci, attended: “What we have learned … is that you guys, men and women, have to travel together at night. … Samantha was by herself. She had absolutely no chance, none. The door was locked, the child-safety lock was on. Get a gun. Don't leave home without it. Have it on you 24/6. Even a tiny one is better than nothing.Make sure it is close by you even on Shabbath. You never know when you might need it. You have the right to be not attacked/abused/ etc. After 120 years, let's say you end up never using it; well who cares? You were at least prepared. No one cries about having car/health/life insurance right? Same logic applies here. At the very least at least, eventually move to a pro gun state. Actually there are many American politicians that want to disarm the public. There are few machine guns on the street and they are illegal. Machine guns are illegal unless less one has a Federal license. Just because a gun may look scarey to someone does not make it a machine gun. I don’t recall any other responders mentioning machine guns. As said by others, if this young lady had a gun she might be alive today. We know what happened because she couldn’t protect herself.